The Seville barstool from highly regarded German design partners Alexander Grimm and Ronny Eysser is a strong example of what occurs when you bring together premium materials and extraordinary design. This solid timber barstool, seen here in an organic inspired natural finish, is yet another superb furniture piece from European furniture trailblazers, TON CZ. Working together on the design of the Seville barstool, we think designers Grimm and Eysser created what might just be a near perfect backless wooden bar stool. TheSeville bar stool was inspired by the stepped and terraced province of Seville, Spain, giving the designer bar stool its name. Seville is considered one of the foremost wine regions in the world, and this storied Spanish province proved to be a wonderful muse with both the beauty of the landscape and the free flowing wine. It is perhaps possible that Eysser and Grimm created the Seville wood barstool for no other purpose that providing people with a comfortable and comely barstool to sit upon and enjoy the many varieties of vino Seville offers. Not only does the Seville bar stool offer top notch design, solid beechwood and flawless European construction care of respected European furniture makers, TON CZ. 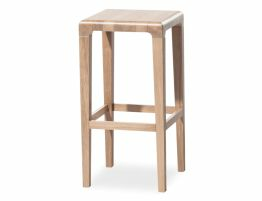 The Seville solid beechwood barstool is displayed here in a natural finish and boasts a smooth, rounded edge sitting surface beautifully grained like a butcher block. This solid wood, naturally finished barstool offers the best of modern design, quality natural materials and superior construction. 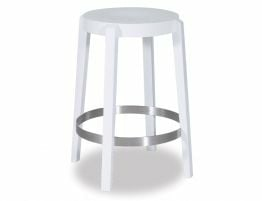 At a height of 65 cm, this kitchen barstool is the right height for most home uses like as a breakfast barstool, kitchen counter stool or for your island seating area. 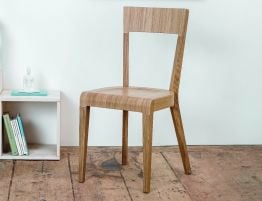 The natural finish is displayed here, however, the Seville solid wood barstool is also available in a whitewash finish, a go with anything walnut finish and an sleek coffee finish. For commercial barstool needs like restaurant cafés coffee houses and bars, the Seville is also available in an 80 cm size option. Incorporate the good looks of this solid wood barstool inspired by the terraced wine region of Seville Spain into your home or kitchen for a style that is at once natural and organic feeling and yet without a doubt refined and polished. 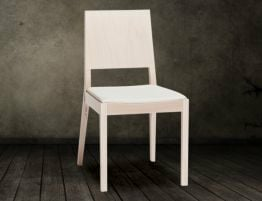 At Relax House furniture, we travel the globe in search of hard to find deals on high quality designer wood furniture that we know Australian furniture lovers are seeking. If you are looking for barstools, kitchen bar stools, café stools, solid wood bar stools, modern barstools, designer barstools or more, we probably have it.